If you are participating on the "Here We Come A Caroling Blog Hop"
Hopefully you just arrived from my comadrita's Abby blog. If not, and you wish to join us, please start with our host HERE. 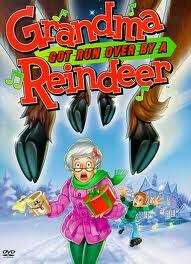 the song "Grandma Got Run Over By a Reindeer" came to mind! Immediately after I thought about a picture of me from 1990 when I was vacationing in the Island of Majorca, Spain. I had a camera that had a remote control, but we were too far for the camera to respond to the remote control, so I set up to go to the camera press the "timer" button and why did I think I had to run back?!!! The card is a large 5.5" x 4.25"
All cuts except the snow are from the Silhouette online store. The snow is a PTI die. Here is a copy of the song lyrics.